Allegheny Ludlum’s Terry L. Dunlap, a 1981 graduate of Indiana University of Pennsylvania, will serve as master of ceremonies for the 2010 IUP Legacy Gala. Dunlap, a native of Blairsville, received the inaugural Presidential Legacy Award for Alumni Distinction at the 2008 IUP Legacy Gala. The gala will be hosted by Dr. Tony Atwater, IUP president, and his wife, Dr. Beverly Roberts-Atwater, at the Carnegie Museum Music Hall Foyer on April 10. The program features the 2010 presentation of the Presidential Legacy Award for Civic Service to Glenn Cannon, senior vice president for Hillard Heintze and a 1971 graduate of IUP, and the Presidential Legacy Award for Alumni Distinction to Barbara Russell, actor-educator, a 1954 graduate of IUP. This black-tie event will feature cocktails, hors d’oeuvres, and a silent auction beginning at 6:00 p.m. Dinner will be served at 7:30 p.m., with music and dancing at 9:00 p.m.
For more information or to reserve a table or seat for the IUP Legacy Gala, call 724-357-2145. Tickets are $175 per person. Table purchases are encouraged. 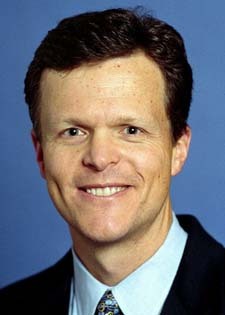 Dunlap currently serves as group president, ATI Flat-Rolled Products, and ATI Allegheny Ludlum Business Unit president. The company is a world leader in the technology, production, and marketing of specialty metals and other alloys in more than thirty countries. During his tenure, Dunlap has been part of a leadership team that has grown Allegheny Technologies into one of the largest and most diversified specialty metals producers in the world, with approximately 8,500 employees and revenues of $3 billion during 2009. ATI has been a member of the Fortune 500 and has been recognized by Business Week magazine as a top-performing company in the United States. Dunlap began his career in the metals industry as a sales representative for LTV Steel in Chicago and joined Allegheny Ludlum in 1983. He held numerous positions in sales, marketing, supply chain, and operations at Allegheny Ludlum before he was promoted to vice president of e-business and chief information officer of parent company ATI in 2000. In 2001, he was named vice president of procurement and CIO of ATI before being named president of ATI Allegheny Ludlum in 2002. Currently, Dunlap serves on the national board of the Metals Service Center Institute. At IUP, Dunlap was a member of Kappa Sigma fraternity and advertising manager of The Penn, IUP’s student newspaper. He attended graduate school at Loyola University Chicago, studying in the MBA program. He was honored in 2007 with IUP’s Distinguished Alumni Award. Dunlap has served IUP as a member of the Foundation for IUP board of directors and of the Business Advisory Council, as a major gifts volunteer and off-campus volunteer for the Gateways to Opportunity capital campaign and as an admissions recruitment letter signer. An advisor to IUP’s Eberly College of Business and Information Technology, he was a featured speaker at IUP’s Business Day and a sponsor of the college’s golf classic. For the past ten years, Dunlap and his wife, Mary Jo, have funded student tuition awarded through the Terry and Mary Jo Dunlap Endowed Scholarship. In 1997, Dunlap was honored by IUP’s Eberly College of Business as Business Professional of the Year. Dunlap has supported numerous charities and organizations over the past twenty years, including serving as a coach for Fox Chapel’s youth baseball, basketball, and soccer programs.